Paleo Update Saturday, my father-in-law was released into hospice care to begin his end of life days. When these times of intensity happen in life, it throws us into a different dimension of activity outside our normal routine. “Regular” life stops for a bit to be replaced by weird schedules, by unusual demands and activities only needing to be done a few times throughout a whole lifetime. How many times does a non medical professional order a hospital bed, empty a catheter bag, etc. 3. Get fully presentable (shower, wash hair, make-up, etc) every morning. You may have to go to a group gathering at a moment’s notice where you would be embarrassed in schlocky sweats and ratty T shirt. 4. Keep the gas tank of your car full at all times. 5. Bring enough water bottles to get through a 12 hour period. Hospitals and emergency agencies hide the water; I swear. Plus, even though you are doing essentially nothing–at least nothing physical—when sitting by a sick person’s bed, time disappears. Your thirst can rage. Your blood sugar can drop. 6. Try to get a good amount of sleep. If you can keep on top of just these foundational things, it will help you manage the unusual time and activity demands in fairly good form, relatively speaking, until normal life can be resumed. This post is for all those attending last days of loved ones, attending births, or going through any of a myriad of life’s intense once-in-a-lifetime moments. Below is the recipe to one of my favorite Paleo cookie recipes. This recipe by Carol Lovett is from her cookbook, The Grain-free Snacker. Check out her blog, Ditch the Wheat. 1. 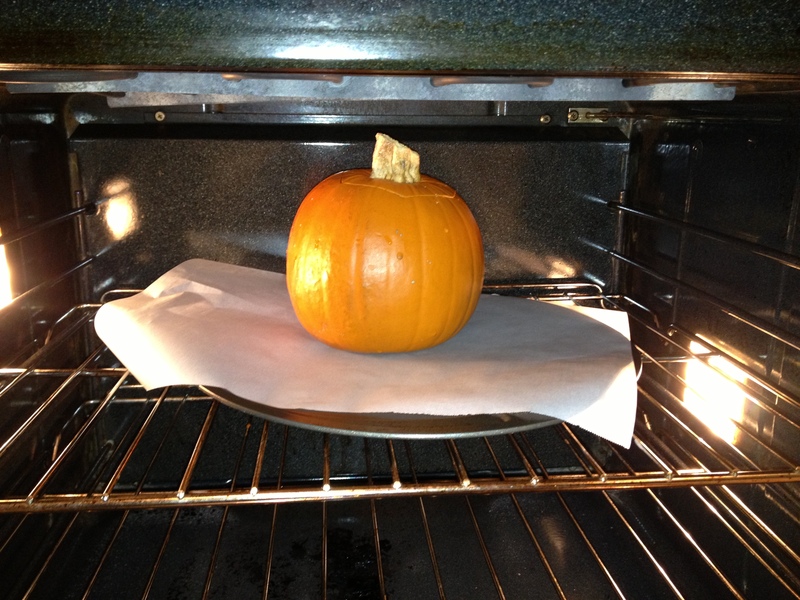 Preheat oven to 350* F. Line a baking sheet with parchment paper. 2. Using a mixing machine, mix together the sugar and coconut oil. 3. Slowly add one egg at a time to the mixture. Add the cocoa powder, coconut flour and vanilla, and mix until incorporated. Lastly, stir in chocolate chips. 4. Drop the cookies by spoonfuls onto the baking sheet, at least 2 inches apart. 6. Let the cookies cool for a few minutes on the baking sheet before moving them to a wire rack to cool. Note: Check out her blog or cookbook to get the extra notes for the prep of these cookies. I just included the basic directions. She gives more detail in her official recipe. As you can tell, I usually cook without recipes. When I use them, I rarely follow directions completely, which does not always make for great baking success, but these cookies turn out in spite of my cavalier ways. (The Naked Chef, Jaimie Oliver, epitomizes my style of cooking. Love when he says in his cookbooks or on his show…”pour in a couple of glugs” of the designated liquid, but I digress.) Seriously, these cookies have become my Paleo comfort food during times of stress. I recommend always having a batch on hand. I know I do. They freeze well, too. Hats off to Carol Lovett and this yummy recipe! Posted in Celiac Disease, Comfort Food, Eating Out, Emotional Issues, GF Travel, Gluten free Living, Grain-free, Paleo Diet, Products, Recipes and tagged Celiac Disease, Eating out When Traveling, food, gluten free food, gluten free recipes, Gluten Intolerance, glutenfree, health drinks, paleo diet, restaurants. Bookmark the permalink. – After rolling along for 15 years, getting healthier on my gluten-free diet, exercising more, enjoying more stamina, getting fewer flues and colds, feeling like “I got this down,” my body morphed, yet again. Two months ago, my intestines started the cramping of old, before I got diagnosed with Celiac disease. – After re checking all my foods, vitamins, cosmetic products to make sure the manufacturers had not changed their formulas, I started playing with food groups. Maybe raw foods or dairy were bothering me. I eliminated known allergy groups, one at a time; then tried adding each back. No pattern developed. The intestinal pain increased. Randomly, in a new hair salon, I met a gal who was just four months into the Celiac diet. She asked to go to lunch to tap my 15 year experience with the cooking, cosmetics, etc. Off we went. However, my knowledge about particular products seemed minimal to the vast knowledge of new research she had acquired about the disease. Comfortable with my diet and continual improvement in health, I had stopped keeping up on the latest research. – Who knew that all grain, including the ones deemed safe, like rice, corn, buckwheat, did in fact have minimal bits of gluten? – Who knew that the chemical structure of legumes is so similar to the gluten molecule that many Celiac patients’ bodies cannot distinguish the difference and treat it as gluten? The answer for now…the Paleo Diet. I got the name of one of the premiere Celiac specialists in the nation from my new acquaintance, now friend. I have an appointment for mid January to find out the particulars of my intestines’ gyrations. (I will keep you posted on the outcomes of that.) However, the increasing pain I have been experiencing caused me to jump into the Paleo Diet just to see if I could get some relief. Needless to say, having nearly died from this disease once, opening the door of eliminating even more food in order to stay healthy triggered a bit of an emotional storm. My husband wonders if by the time I am 80, I will be a breatharian. He may not be too far off. Pain drives action, so I opened the fridge, tossed, trashed, and cried my way through the purging of even more types of food. Yep, I am down to fruit, veggies, and meat. Even commercial mayonnaise has soy (a legume) in it. -I have lost two pounds. -My clothes are fitting better. -My skin is less dry. We live in CA, in a small wine region, where almost everyone is a foodie of some sort. I am struggling with how to make truly delicious, memorable, enjoyable food on this very limited repertoire. Luckily, there are tons of cookbooks out there for the Paleo diet. I need to do a little research and to get my kitchen completely stocked and purged so my creative cooking can find its way down this new path. I am usually up for a challenge, but I am a bit resistant at the moment. Once I get all the transition “stuff” done, I know my normal enthusiasm will emerge. Right now, I am vacillating between an “I can conquer this new diet” day and a “this is really hard and not fun” down day. Below is one of the recipes we came up with over our first weekend on the Paleo diet. (My husband came up with the idea of these Thai flavored shrimp-stuffed mushrooms. I just filled in the bits to make the idea come to life.) Try making this with one person gathering and prepping each ingredient, like shelling and cleaning the shrimp, and another person at the chopping block ready to mince everything in sight. Some MUSTS, of course, are lovely background music, cool aprons, and two glasses of dry, well-balanced Sauvignon Blanc or Champagne to accompany the cooking process. A fun cooking-date will ensue. Grease baking pan with coconut oil. Line pan with mushroom caps. Pour a bit of whatever white gf wine you have opened over each cap to keep them from turning pink, while you prepare the stuffing. Clean and mince all ingredients indicated from above. Sauté shallots, ginger, mushroom stems, shrimp, and pancetta until shallots and mushroom caps are softened and pancetta and shrimp are cooked. Throw in parsley, garlic, and thyme leaves and sauté another 30 seconds or so. Do not over cook the garlic, or it will turn bitter. Taste. Salt and pepper to bring out flavors. Add more curry paste for more heat, etc. When the consistency and taste are the way you want it, take off the heat and stuff each mushroom cap with the mixture. (We made them heaping full.) Sprinkle a few more bits of coconut on top. You can fill the pan with ¼- ½ inch white wine for added flavor. Pop in the oven for 10-15 minutes, checking for doneness at 10 minutes. I like cooking them at the higher temperature because the mushroom caps hold their shape better when serving and do not get mushy. Posted in Emotional Issues, Gluten free Living, Paleo Diet, Recipes and tagged Celiac Disease, food, gluten free food, gluten free recipes, Gluten Intolerance, grain free diet, paleo diet. Bookmark the permalink. When the nights cool enough to thicken and to dark-spot the skins of the tomatoes, it is time to pull up the summer garden. Today was the day the tomatoes spoke. With a bit of regret, I pulled out the withered remains of the most abundant, lush vegetable garden I have ever had. 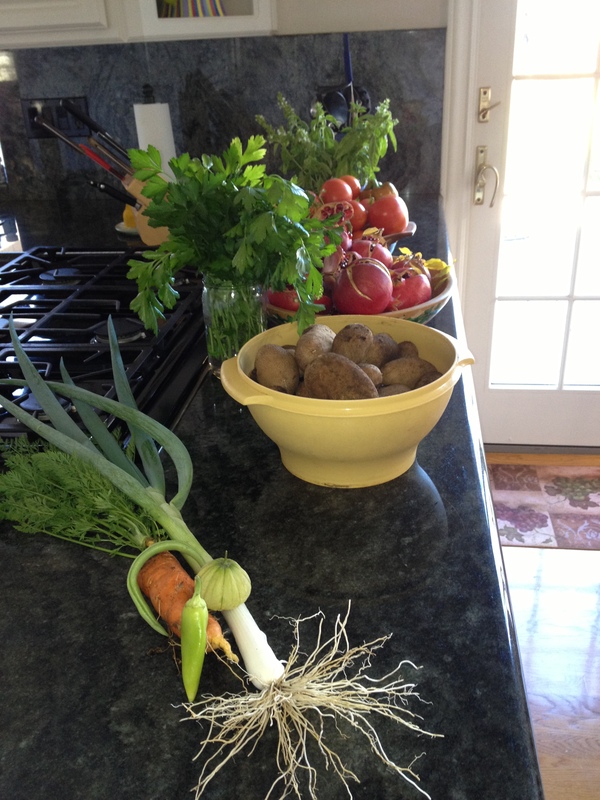 This Fall has been so mild I wondered if the garden might keep producing into December. The middle of November is not bad for a long growing season, though. I’ll take it! Right before dismantling the tomato cages, I remembered I had planted potatoes (a first time try) in between each string bean plant. (They are companion plants.) The potato greenery died and blew away a few weeks ago. Wondering if there might actually be potatoes in the dirt, I got on my knees and started digging. Random sized potatoes popped up. 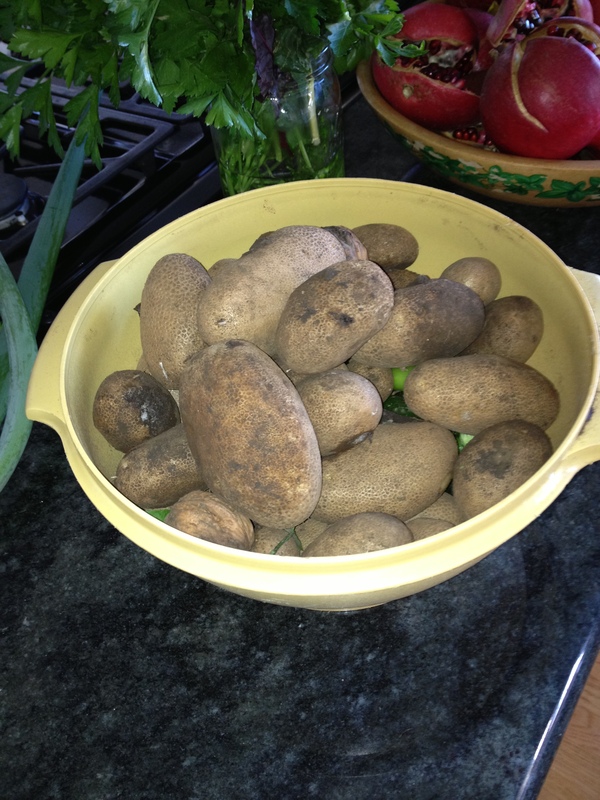 Delighted with each find, I kept at it, finally ending up with enough for a whole baking pan of roasted potatoes…or Roasties, as my husband calls them. Thrilling! When I got to the kale/parsley patch, I just couldn’t pull it up. 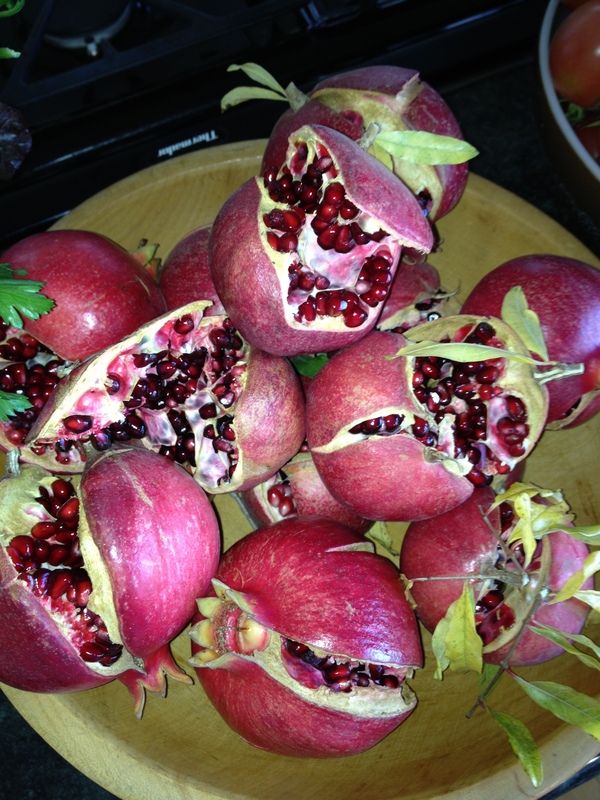 Each has made a remarkable comeback in the cooler weather of the last couple of months. I will wait for the frost to flatten them. 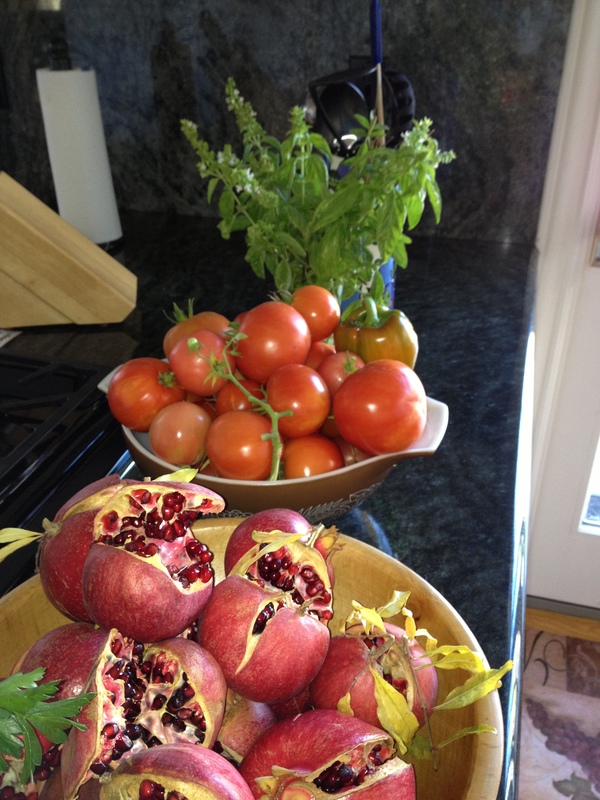 Crazy…how much produce came from this last picking of the season! Bounty everywhere! As excited as I get by food coming from backyard dirt, not all was rosy when plopping the bowls of veggies on the counter top. As I was making dinner last night (a delicious meal baked in a sugar-baby pumpkin), I noticed three or four slow-moving, little black spots on the white cupboard doors. Hands messy with pumpkin goop, I couldn’t kill them at that moment. When my hands were finally clean, they were gone. “Eww!” I decided not to think about where they had gone. You cannot be squeamish living this intimately with the land. (http://www.againstthegraingourmet.com) for the bread. I recommend toasting the bread before using, so it holds its structure during the baking. 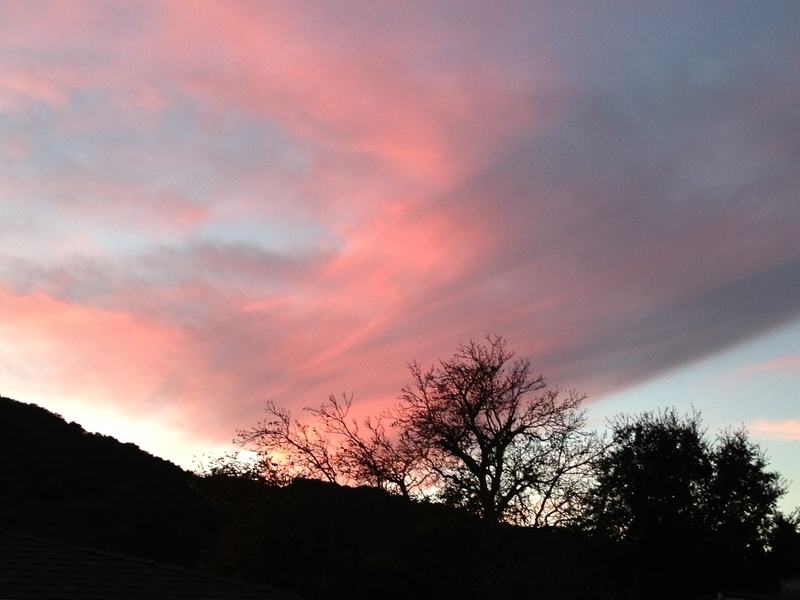 As I prepared the pumpkin dish, the gift for the day of garden labor was this beautiful sunset. Posted in Gardening, Gluten free Living, Products, Recipes and tagged Celiac Disease, Country Living, food, gluten free food, gluten free recipes, Gluten Intolerance, wine country lifestyle. Bookmark the permalink. As I gather a tomato and cucumber for a Greek salad from the kitchen veggie garden, I don’t know where the time went. How did it get to be three o’clock? -Didn’t I just put on farm clothes, grab the pruning shears and drop bunches of grapes to allow the remaining clusters to deepen their flavor? -Didn’t I just spend a couple of “minutes” with Ted Medeiros, my mentor, trying to absorb his assessment…making mental notes of his laundry list of chores to keep last Fall’s vintage, now aging, on tract and hopefully, tasty? It dawns on me that my body is screaming for some quality food. Around the corner I go, into the vegetable garden to rummage any ripe produce I can get. Thus, the Greek salad fixings for a very late lunch. Chop everything not in the dressing into bite size pieces. Mix dressing in a small bowl. Pour over chopped ingredients. Gently mix, just to coat all the chunky bits. Enjoy the rich blending of these garden fresh ingredients that shriek…it is summer! The good news!!! I have zero gluten reaction to our back yard wine aged in completely wheat free oak barrels, which come from Hungary. I can be tipsy with no stomach cramps, no brain fog, no sick exhaustion. After two years of abstinence from all wine aged in oak, I can at least drink this. The trick is learning how to make something I would want to drink. Hmmm. Posted in Gluten free Living, Products, Recipes, The Wine Controversy, Vineyard Management, Wine Making and tagged Celiac Disease, Country Living, food, gluten free food, gluten free recipes, vineyard management, wine, wine country lifestyle, wine lover, wine making. Bookmark the permalink. 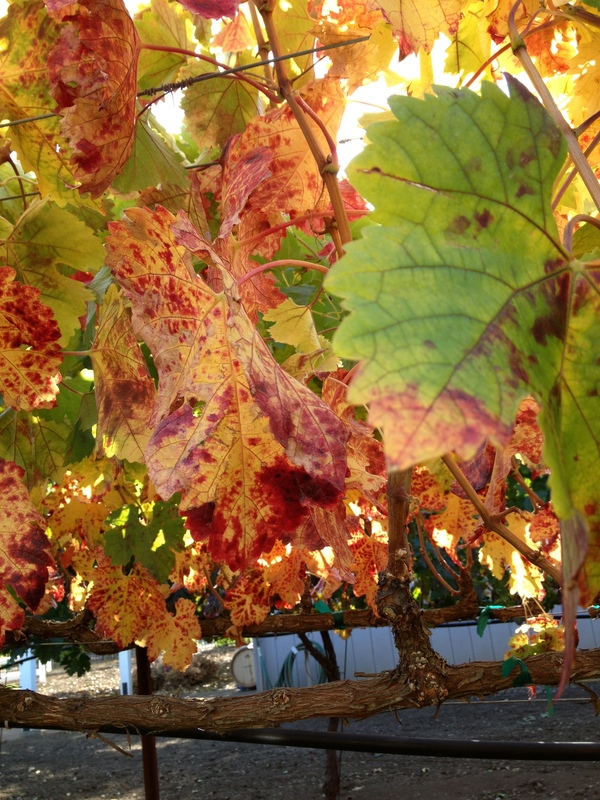 I am sitting among the turning leaves between a row of Cabernet and Merlot grapevines, thankful all the 2013 wine has been safely picked, fermented, pressed, and tucked away in gluten-free Vadai , Hungarian oak barrels . I had no concept of the intense fun and camaraderie, of the immense quantity of hard work, and of the huge expense this “little” hobby would bring to my life and my husband’s life. 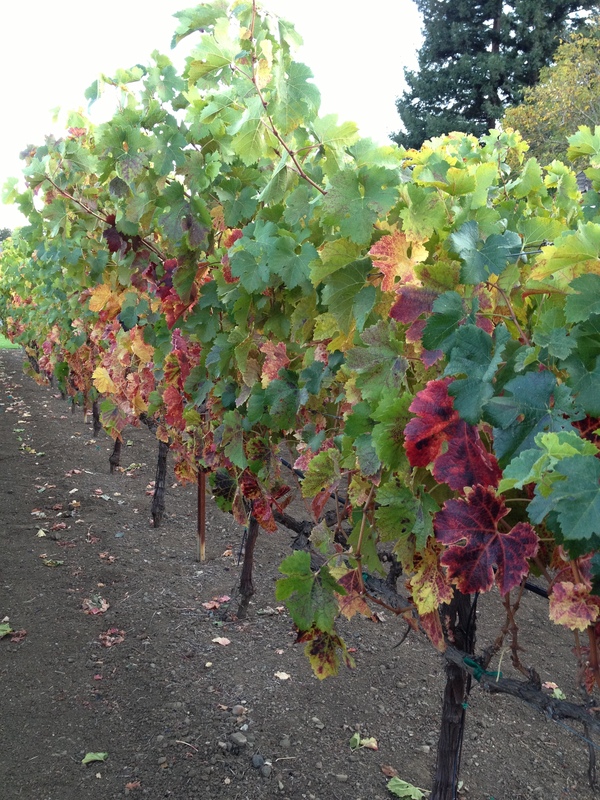 Although I have posted virtually nothing for months, because the vineyard chores hoarded all my free hours this summer, I did bang out a few words along the way to try to capture some of the stages of vineyard management and wine making. If you don’t mind a bit of back-tracking, I will post some of them over the next few weeks dating the month of the activity. Seven years ago, we planted tiny pencil-thin grapevine sticks in our backyard with the hope of beautifying a bare patch of dirt. 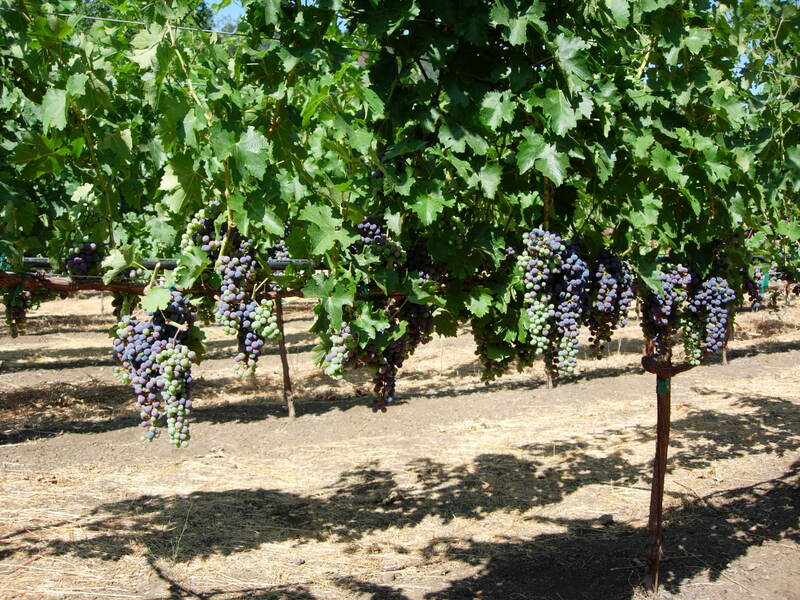 85 bare root Cabernet and Merlot sticks filled ¼ acre…two rows of Merlot and four rows of Cab. From the first day we moved here, my husband longed to look down rows of grapevines when sitting on the deck. And…make an attempt at wine making one day. Other people made homemade wine out of a few grapevines on their property. If you have read any of my previous posts, you already know that question can be dangerous for us. I guess we epitomize Einstein’s definition of insanity, because it is still our fall back question. Conversely, that question has caused us to stretch and grow in ways we never thought possible, and for which we are now immensely grateful. Every vine “took” in the ensuing summer. “Yee Ha! We are on our way!” Summers two and three, my husband carefully trained the vines to grow on the trellis system. We watched the vines get big enough to consider harvesting the grapes for a little wine making. Year four, we got out the trusty wine manual, called From Vines to Wine, that our neighbor who had been making wine for a few years told us was all we would need to get started. “Could one book be all we would need? Really?” That attempt went into the compost pile. However, we did have the best smelling yard on the street. Year five, I got a bit of advice from the local wine makers at Mann Vineyard, Sycamore Creek Vineyard, and any other local vineyard, whose wine maker would spend a bit of tasting room time answering my questions. That batch got bottled, labeled, and given to friends. Yet…most of it went down our friends’ drains or in Sangria or spaghetti sauce. That brings us to this year. Year seven. About April of this year, I was lucky enough to be able to start mentoring with Ted Medeiros, a Double Gold Medal winner in the San Francisco Wine Competition. You need to know that this is HUGE. The San Francisco Wine Competition is the biggest US competition and the biggest world wide…outside of France. Since April, Ted has helped me learn how to maximize the flavor in the grapes through vineyard management and has helped me save last year’s aging wine from turning into another grotesque tasting vintage through aging-wine care and maintenance. All aspects from vines to wines have been addressed. He is an exacting task master, keeping me working…HARD…too tired and sore each day to contemplate anything but a hot shower. He is also a positive feedback teacher, which kept me going when I wanted to give up. Amid the long hours and relentless amount of work, I feel lucky to be learning from a genuine pro. Like anything worth learning, my husband and I are finding out that the more we learn the more we need to learn. We are the type that like to do everything ourselves with a little (okay, a lot) of help from friends and family. After all…. This is a homemade sweetened ricotta cheese stuffed into or put on to just about anything!!!! When desired heat is attained, TAKE OFF THE HEAT. Scoop the forming curds into a cheesecloth covered funnel and place in refrigerator overnight to drain. Makes about 1 quart of ricotta cheese. 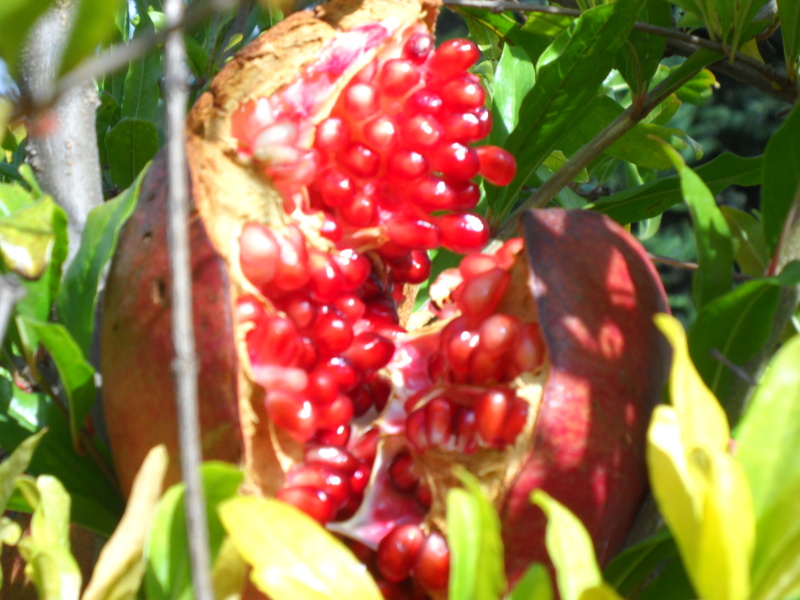 Take sugar and process in food processor for 1-2 minutes until superfine – remove. Process all of above ingredients until very fine but not over processed, as it will get grainy. REFRIGERATE OVERNIGHT – this will allow all of the components to meld together. Then stuff filling in cannoli shells. Traditional sprinklings on Cannoli are chopped pistachios, chocolate chips(mini), or citron. A chocolate ganache over the top could be the ticket as well. Posted in Gluten free Living, Products, Recipes, The Wine Controversy, Vineyard Management, Wine Making and tagged Celiac Disease, Country Living, gluten free food, gluten free recipes, Gluten Intolerance, vineyard management, wine, wine country lifestyle, wine lover, wine making. Bookmark the permalink. When my husband tried my gluten-free adaptation of an h’ordeuvre I had at book club and loved it, I knew I had to post it. Because it is so easy, fast, and elegant I wanted you to have it for that surprise visit by friends or family. Will be great for that Super Bowl Party! The original recipe came from Caprial Pence on his show, Cooking with Caprial. I have no idea what the original recipe is, because I just made up my own from tasting the h’ordeuvre my book club friend served. 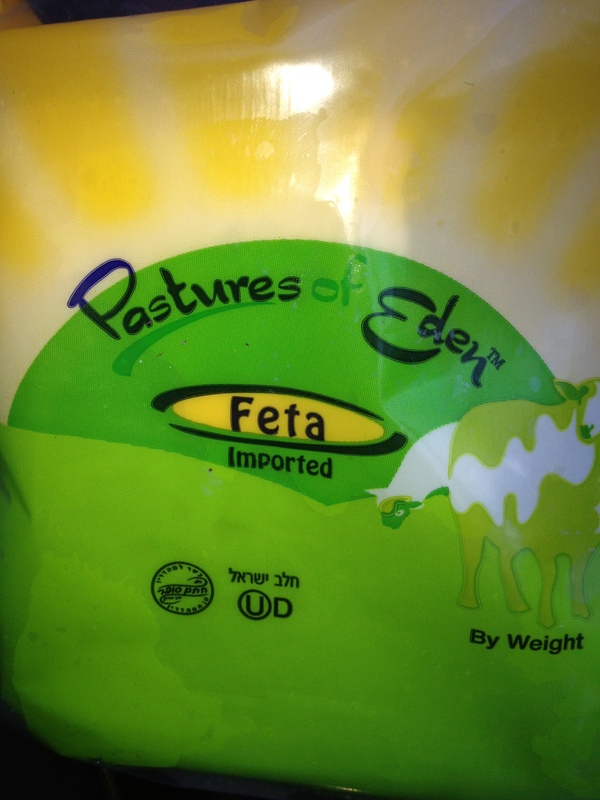 GF Sleuth’s version of Caprial’s Marinated Goat Cheese Spread. Throw a whole goat cheese log into a zip lock freezer bag. Fill the bag with balsamic vinegar, until it covers at least half or all of the goat cheese. Then remember it needs a bit of olive oil, so pour two to four glugs of olive oil into the bag. Throw in a couple of scoops or handfuls of dried thyme. I also threw in some fresh thyme sprigs, about 6-8. Squish gently, so all the goat cheese turns that wine red color of the balsamic vinegar without altering the log shape of the cheese. Let marinate for 3 or 4 hours or 2 days. Take out and put the cheese log on a beautiful platter or tray. Top with the chopped olives and a few artfully arranged bits of thyme. Put slices of your favorite GF baguette or crackers around the edges of the platter. Serve with a little knife, allowing guests to grab a baguette slice or cracker and slice off a bit of cheese log to spread on top. Voila! The easiest and most elegant tasting h’ordeuvre I’ve made or served in a long time. Posted in Recipes and tagged gluten free food, gluten free recipes. Bookmark the permalink. What I know about chronic conditions is that it is every day, every minute…no days off! One of my dear friends, who is extremely careful and conscientious about following her diet, just went on a four day romantic, bed and breakfast getaway with her husband. Of course, she wanted a vacation from her daily routines. That is the fun of vacation. However, just a tiny bit of deviating from her rigid dietary restrictions in the name of “I can’t take it any more; I need a couple of days off” landed her in bed for four days after her four day vacation…in misery. Was it worth it? No one can judge. The relentlessness of scrutinizing every single bite that goes into your mouth, can wear a person down emotionally. Sometimes we all just need to cheat, be a little sinful, or simply relax the rigidity. Yes, we pay, but sometimes in the name of our emotional health, the cost may be worth it. Roast two GF marshmallows over a campfire gone to coals until golden brown. Core and slice an apple in 1/8 to ¼ inch slices, horizontally with the core hole in the center. Put a slice of the apple and a square or three of chocolate on one graham cracker. Grab the marshmallows off the roasting stick onto the cracker, chocolate, apple combo with another graham cracker. Squish and eat. Yum! Posted in Emotional Issues, Recipes and tagged gluten free food, gluten free recipes. Bookmark the permalink.